For many people, especially those living in poor countries, climate change feels like a tangible reality they have to cope with every day. Negative effects of climate change are most visible in the world’s developing countries, whereas the industrialized countries mainly contribute to the deterioration of the world’s environment. One hard-hit country is Bolivia. Its farmers have to live from what the earth, the Pacha Mama, yields. The change in climate conditions has led to frequent frosts, floods and water shortages. According to scientists, rising temperatures have accelerated the retreat of the Andean glaciers throughout Bolivia, Colombia, Ecuador and Peru. The UN’s Intergovernmental Panel on Climate Change predicted in 2007 that a rise in temperatures could melt away all Latin America’s glaciers within 15 years, threatening important water supplies for the population. These issues were at stake at the Copenhagen climate talks in December 2009. Bolivia’s President Evo Morales, disappointed by the absence of a firm commitment from industrialized countries at Copenhagen, decided to hold a counter-summit in April in the Bolivian city of Cochabamba. Climate change is another major issue putting stress on Bolivia’s already hard-hit economy. 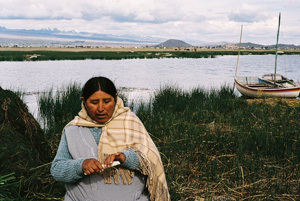 Bolivia is one of the poorest and least developed countries in Latin America. About 60% of its 9.9 million inhabitants live below the poverty line. Apart from poverty, the country holds another sad record. Following to a recent survey of the American State Department, Bolivia is the world’s third largest producer of coca, the raw material for cocaine, after Colombia and Peru. The document estimated that Bolivia’s coca cultivation grew by 10 percent in 2009, and by 50 percent since 2007.